Join the UNA-USA Southern NY State Division & the Public-Private Alliance Foundation for an afternoon highlighting innovative programs to combat poverty in Haiti, with a focus on the United Nations Sustainable Development Goals. See flier for details. David Stillman and Rose Bazile will present at the Club Aux Antilles UN Staff Recreation Council on March 1. Their topic is "Sustainable Cooking Fuel for Haiti Teamwork to Replace Dependence on Charcoal." Fedno Lubin is the young photographer mentioned on our Welcome page. We first met him in 2012 when he was a student at the Art Creation Foundation for Children in Jacmel. We have just learned that one of Fedno’s photos has been accepted in a juried competition for a show at the Upstream Gallery in January 2019. PPAF is happy to be promoting his work in the USA as part of our efforts to encourage sustainable development in Haiti. Below is the photo that was accepted for the exhibit. 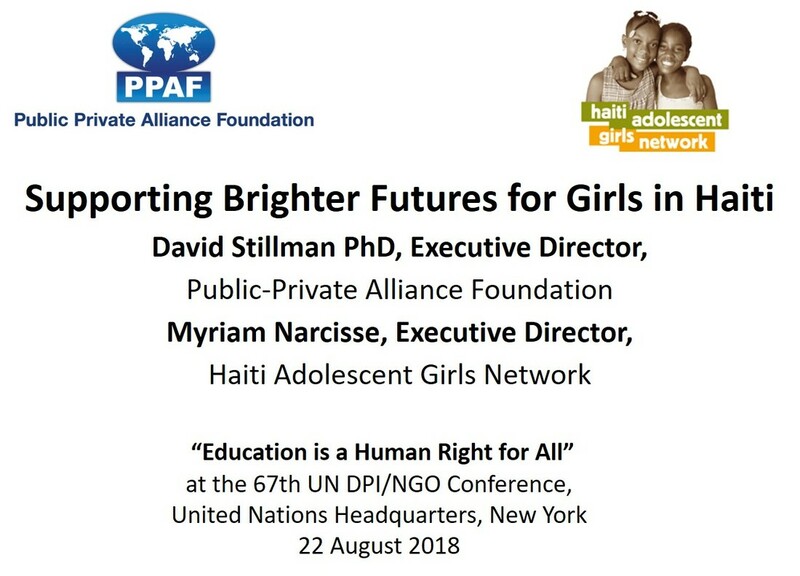 The Haiti Adolescent Girls Network (HAGN) Executive Director and the PPAF Executive Director collaborated in a presentation in August at a panel on education for girls, held in the annual NGO conference hosted by the UN Department of Public Information. HAGN is a Haitian non-profit that initiates and manages safe space groups for teen-age girls who are at otherwise at risk of limited schooling, early pregnancy, early marriage, negative self-worth and a bleak future. In weekly gatherings the girls learn about sexual and reproductive health and gender relations, build financial literacy and employability, and create friendships with peers and mentors. HAGN now has a total of some 4,000 participants. PPAF became involved, along with Solavore LLC and SCI, in a pilot effort by HAGN to learn whether solar ovens are useful for girls to make popular snacks and start their own eco-friendly cooking business in the local street-corner markets. The presentation "Supporting brighter futures for girls in Haiti" was very well received. Fifty people attended the panel, which drew considerable interaction. The Benefit, to be held at Resource Furniture on July 12, will give opportunity for participants to learn about our program and those of our partners. Rose Bazile of KDCK and a Solavore representative, Alan Bigelow of Solar Cookers International and Kathy Puffer of Solar CITIES Biogas wiill join David Stillman to talk about their work in Haiti. An exciting silent action will feature a 22-year=old Rhum Barbancourt in a special decanter, a Solavore Solar Oven, a lamp from Arturo Alvarez (donated by Resource Furniture) and a solar oven-cooked meal presented by Rose Bazile. Plus: Haitian paintings and other art. The high-level political forum on sustainable development is meeting from Monday, 9 July, to Wednesday, 18 July 2018. The theme is: "Transformation towards sustainable and resilient societies". PPAF and Solar Cookers International displayed their programs at a booth. David Stillman, Alan Bigelow (SCI) and volunteers interact with visitors,numbering 49 on the first day. The first week includes numerous panel and roundtables on the theme and on the SDGs under review. We held a very successful, exciting seminar during the UN Commission on the Status of Women, bringing together colleagues and partners who are working in Haiti and in other countries to expand availability of clean cookstoves and promoting entrepreneurs. Thank you to the UN Association of the USA Southern NY State Division for partnering and the UN Foundation for the venue. Links to videos of the event and to the PowerPoint presentations appear here. PPAF Executive Director David Stillman and Solar Cookers International representative Alan Bigelow were delighted to hear that solar cookers were among the items on board. Chef Andres and the team #ChefsForPuertoRico have so far organized over one million meals there. Both Stillman and Bigelow joined the Q&A with Sam Kass (former White House Chef) and Moderator Susan Ungaro (James Beard Foundation President) as part of a concern for cooking and relief in Puerto Rico. We were moved by the compelling video Chef Jose Andres made at last year’s Social Good Summit. In it he said the fire that enables him to cook is also for many worldwide a fire that is fed by wood and charcoal. Gathering and using these deprives girls of education, hillsides of trees, and mothers of their health. That’s why he vigorously promotes clean cooking. Here is the video. Hery Martial RAJAONARIMAMPIANINA RAKOTOARIMANANA, President of Madagascar, emphasizing that human needs must be at the center of any country’s concerns, said the recent economic and social crisis had left Madagascar with a high poverty rate and afflicted by food insecurity. Despite those challenges, however, the country had no reason to remain poor, he said, describing himself as an optimist. Through the relentless work of its citizens, Madagascar was now reaching a new stage, and since 2016 had received increased investment, enabling it to develop key sectors, reduce poverty and act on behalf of the most vulnerable segments of society. 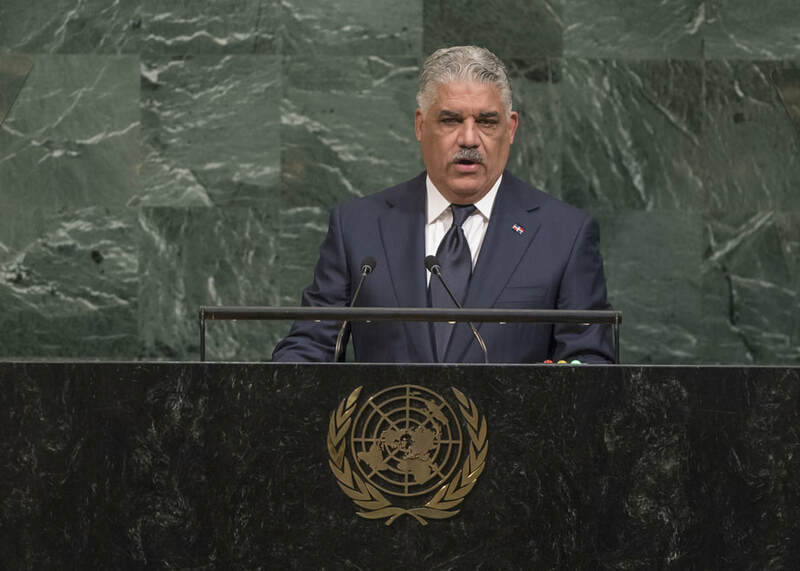 MIGUEL VARGAS, Minister for Foreign Affairs of the Dominican Republic, apologized for the absence of President Danilo Medina, who had been compelled to return home to deal with the threat of Hurricane Maria. Expressing deep solidarity with the victims of Hurricanes Harvey, Irma and Maria, he noted that accurate figures for the damages to many Caribbean islands had not yet been determined. However, it was clear that the damage was substantial, and that recovery would take years, he said. Valuable lives had been lost. He went on to say that the material losses resulting from Hurricane Irma had far exceeded his country’s GDP. “Our economies, our way of life and our development potential are in danger,” he emphasized, calling upon other nations to join forces in helping the Caribbean region confront the threat. “It is not enough to send messages of solidarity or humanitarian aid,” he stressed. “And it is absolutely not enough to sign agreements on climate change.” Those agreements must be coherent, move a joint agenda forward, and develop concrete action plans, he said, proposing the creation of a special fund to deal with natural catastrophes while fostering awareness, prevention and resilience strategies. ​JOVENEL MOISE, President of Haiti, said the mission of the United Nations had never been so important, and thus, it was necessary to adapt the Organization to modern realities on the ground. Expressing support for any initiative that could contain crises and seek the peaceful resolution of conflicts, he encouraged the United Nations to move along the path of conflict prevention. Haiti had always spoken out against the proliferation of nuclear weapons, and he condemned States’ blatant desire to acquire and increase nuclear arsenals. He also expressed concern about the ongoing crises in Syria and Venezuela, as well as the conflict between Israelis and Palestinians. 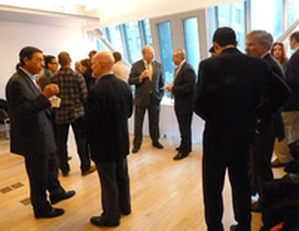 The Girl Innovation, Research and Learning (GIRL) Center held its seminar on September 13 in New York. 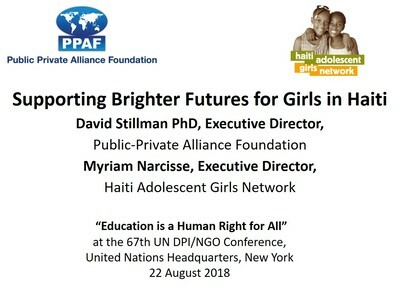 PPAF Executive Director David Stillman attended and had opportunity to underscore PPAF’s collaboration with the Haiti Adolescent Girls Network (HAGN) and building entrepreneurship skills in their “My Space” girls clubs. (HAGN) is one of the initiatives receiving attention and support from the Population Council.) The session was moderated by Thoai Ngo, Director of the Council’s Poverty, Gender and Youth Program and Director of the GIRL Center. Panelists included:David Evans (World Bank), Dasmine Kennedy (Ministry of Education, Jamaica), Albert Motivans (Equal Measures 2030) and Stephanie Psaki (Population Council), ​The group emphasized the importance of: ensuring the dis aggregation of data to better understand the status of access and accomplishment for girls; the availability and importance of multi-sectoral information from education, health, social services, labor statistics etc. ; communications between researchers and policy-makers; prospects for improved health and livelihoods after schooling; and the significant return, at national and family levels, from investing knowledgeably in education for girls. The World Organization of Governance and Competitiveness(WOGC) held a high-level global meeting, hosted by the Permanent Mission of Zambia, at UN Headquarters in New York on August 25. The theme was: “Road to the Future of Sustainable Development: “Moving from Commitments to Results through Inclusive Innovation.” Close to 500 participants attended, including political leaders, delegations, representatives of the private sector and civil society, and UN staff. WOGC reports a membership of over 2,000,000, from large, small and medium, government owned and private businesses, and experts available from China, Japan, South Korea and Singapore. The meeting dealt mainly with integrating technologies and management of innovative industries from China into African, Latin American and Pacific countries, and introduction of a global action plan for poverty reduction, emphasizing low cost housing and digitization of national resources. Upon PPAF’s introduction to WOGC management, Dr. Alan Bigelow, Science Director and UN Representative at the UN of Solar Cookers International, was invited to address the conference. His well received statement, “Solar Cooking: A Cross-cutting Solution for Sustainable Development,” covered types of solar stoves and ovens, their uses and benefits, global distribution statistics, relation to all 17 of the UN Sustainable Development Goals, and prospects in Haiti and Kenya, where SCI and PPAF are part of consortium efforts. Here are photos from the day. ​ Please contact us to obtain copy of the presentation. 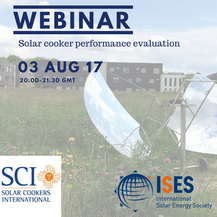 Solar Cookers International (SCI) joined the International Solar Energy Society to organize a webinar on August 3 on cooker performance evaluation. This was important to PPAF in relation to promotion of public capacity for testing solar cookers and verification of such capacity in project work in Haiti and elsewhere. Moreover, PPAF collaborators were presenters. Solar cooking uses free solar energy for no-emissions clean cooking, and various products and designs exist; but not all solar cookers are equal. In response to expressed needs to develop the capacity for testing solar cookers, SCI, as a non-profit international organization and global convener of the sector, has developed a performance evaluation process(PEP) and has also designed and built open-source, low-cost, portable PEP testing stations that apply the appropriate recognized protocol. The webinar included an overview of solar cooking and response to the need for solar cooker evaluations by Julie Greene (SCI Executive Director), a review of the ASAE S580.1 protocol for testing and reporting solar cooker performance by Dr. Paul Funk (American Society of Agricultural and Biological Engineers), a description of the new SCI Performance Evaluation Process (PEP) by Dr. Alan Bigelow (Science Director, SCI) and a manufacturer’s perspective on the value of solar cooker PEP results by Anne Patterson (Founder and CEO, Solavore). Please contact us if you wish to obtain copy of the individual presentations and related graphics. 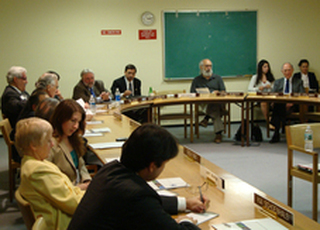 The UN Department of Public Relations, Non-Governmental Relations Unit (DPI/NGO Relations) (http://outreach.un.org/ngorelations) and the NGO/DPI Executive Committee (http://ngodpiexecom.org) partnered to organize an event entitled “Intergenerational Dialoguesforthe Sustainable Development Goals.” Thistook place on 1 August 2017 at UNHeadquartersinNew York. The aimwasto raise awareness of the high value that youth and older persons can bring to implementation of the Sustainable Development Goals(SDGs) from here to 2030, and foster a shiftin the perception of youth and older persons frombeneficiaries of social policy to agents of social change. PPAF is a recognized NGO associated with the UN/DPI and accredited to the UN Economic and Social Council. Several of us participated in the sessions. Senior Fellow Padmini Murthy led the session “Healthy Living: Physical and Mental Wellness,” Senior Fellow George Garland was a panelistin the session “Sharing Responsibility forthe Planet,” and Senior Fellow Michael Ambrozek along with Executive Director David Stillman introduced PPAF interns Julia Baumgartner, Lidia Koljancic and Violetta Spinazzola to the excitement and intricacies of UN conferences. 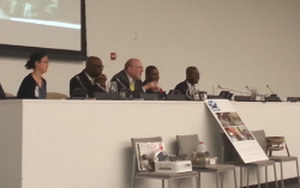 David Stillman spoke on May 23rd at a UN high-level event on Public-Private Partnerships. 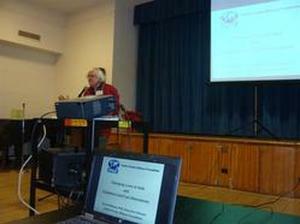 Thanks to Alan Bigelow of Solar Cookers International, we have a video of his presentation. Bruce Knott, head of the UN Department of Public Information/ NGO Executive Committee moderated and spoke at the end about the value of solar cookers in West African refugee camps. See Stillman's speech below. David Stillman and Alan Bigelow, Science Director and UN Representative for Social Cookers International, participated in the stakeholders meeting organized by the Global Alliance for Clean Cookstoves to discuss its Preliminary Action Plan for the Transformation of the Cookstoves and Fuels Market in Haiti. Nearly sixty attended. PPAF has been an active resource to the program since GACC research began last summer. The planning document and discussion covered the current status of the cookstoves and fuel market, proposed interventions to foster an enabling environment, strengthen supply and enhance demand for clean cookstoves and fuel, and the projected impact of this in the shorter and longer-term future. GACC and the discussants emphasized the challenges, the need for step-by-step measures, the importance of women, and the need for a variety of stoves, fuels, and approaches in order to make headway. David and Alan also joined Myriam Narcisse and team members of the Haiti Adolescent Girls Network to discuss bringing solar cookstoves for use in teaching girls' in non-polluting cooking and in developing entrepreneurial skills in Carrefour, just west of Port-au-Prince. On March 15, PPAF and the UN Association of the USA Southern NY State Division co-sponsored this seminar as part of the 61st Session of the UN Commission on the Status of Women. ​We brought together several speakers and representatives from the Global Alliance for Clean Cookstoves, the Population Council, and from two implementing agencies - the Haitian hometown organization KDCK and a school with an environmental focus. Jake Kheel considers the social, economic and environmental impacts of the acceleration of deforestation and the illegal production of charcoal in southern Dominican Republic. ​To learn more about his recommendations for enhance transparency and public participation, click here. 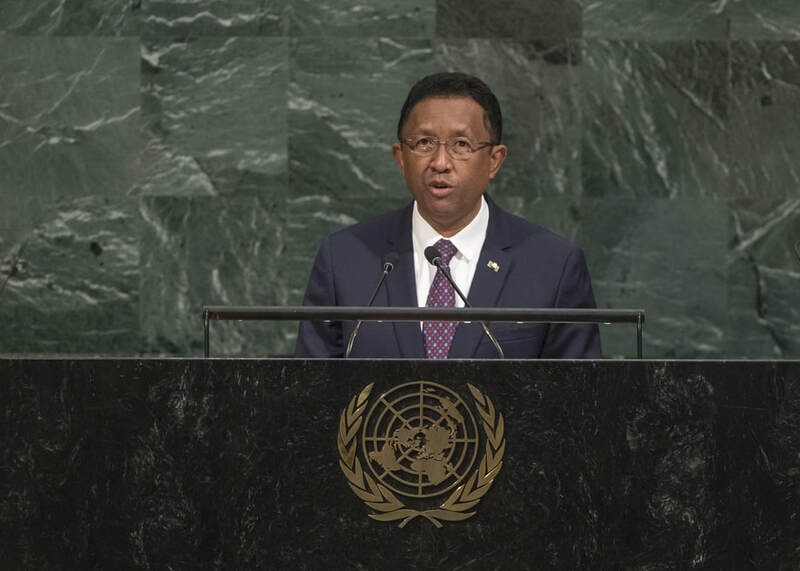 The Presidents of Madagascar and the Dominican Republic, and the Acting President of Haiti each spoke in the General Debate at the opening of the 71st session of the UN General Assembly. Each emphasized the importance of actions toward achieving the Sustainable Development Goals by 2030 and addressed numerous matters of international and national importance. ​The links below take the reader to the UN Webcast video of their statements and the summaries of these. President Danilo Medina Sanchez of the Dominican Republic's Speech Summary. President Hery Martial Rajaonarimampianina Rakotoarimanana of Madagascar Summary. President Jocelerme Priver of Haiti's Speech Summary. Congratulations to Duquesne Fednard and D&E Green! As stated at CGI this week, 103 K improved stoves sold in 5 years, 215 jobs created, 1 million trees saved, 400 K tons CO2 saved and significant marketing innovations. Keep on keeping on! ​Click here to watch the speech. The previous PPAF e-newsletter introduced readers to the powerful, prize-winning documentary film “Death by a Thousand Cuts,” shown in July in Washington DC. The film addresses the ruinous clandestine trade in charcoal from trees cut in the Dominican Republic to meet an insatiable demand in Haiti. 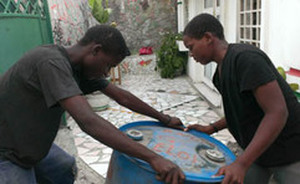 In their research and filming Jake Kheel and his colleagues revealed the interlinked importance of many features – poverty, lack of legitimate employment, national and ethnic difficulties, unscrupulous business, weak institutions, etc., and the terrible trap of Haitian dependence on charcoal for cooking. PPAF is one of the organizations promoting the film, so as to help create broader awareness that leads to action in the two countries and beyond. The film will next be shown at several sites in the Dominican Republic, as part of the DR Environmental Film Festival. These include Wednesday September 14 at 11AM at Universidad Iberoamericana (UNIBE), in Santo Domingo; Wednesday the 14th at 6:30 PM at Puntacana Village; Thursday the 15th at 9 AM at Universidad APEC in Santo Domingo; Thursday the 15th at 7 PM at Centro León in Santiago de los Caballeros; and Friday the 16th at 6 PM at FUNGLODE in Santo Domingo. For further details on this and other films in the festival, please see the list that starts on page 44 of the DREFF 2016 Program attached below. The film is to be shown and discussed at several more sites this fall. For contacts and information please click here. The AFYA Foundation delivers donated medical supplies and equipment from the New York area to hospitals, clinics and related institutions that request and need these in various countries. Haitian destinations have been a priority since before the earthquake. PPAF representatives met recently with Danielle Butin, Executive Director and Sarah Schuyler, Director of Operations and Haiti Rehab Manager at AFYA headquarters and warehouse in Yonkers NY. We agreed to collaborate wherever possible in relation to sites and arrangements in PPAF focus countries. AFYA deliveries range in size from 40-foot shipping containers to 50-pound travelers bags called "Luggage for Life." Shipping and administrative costs have to be covered by or on behalf of the recipients. The goods delivered are quite valuable - in dollars, care and lives. On August 16, 2016, PPAF summer intern Natalie Araya joined over 1,000 young professionals, entrepreneurs, social activists, and student leaders from around the world at the International Young Leaders Assembly (IYLA) conference at the United Nations Headquarters in New York. The conference provided a platform for young leaders to engage with global institutions, learn about leadership strategies, establish a global leadership network, and reflect on actions to take on critical issues. The program included a high level plenary with moderators Justin Fong, Vice President, Global Young Leaders Assembly; and Julia Maciel Gonzalez, Counsellor, Permanent Mission of Paraguay to the United Nations, an interactive session, as well as a high level youth panel. July 27-28, 2016: "Film Premiere & Discussion in Washington, DC"
A powerful, prize-winning documentary film, “Death by a Thousand Cuts”, had its Washington DC premiere on July 27. A select group met the following morning to discuss next steps, leading from awareness to action. The film addresses the ruinous clandestine trade in charcoal from trees cut in the Dominican Republic to meet an insatiable demand in Haiti. ​Set in the context of an actual murder, it explores the complexities of deforestation along the border. 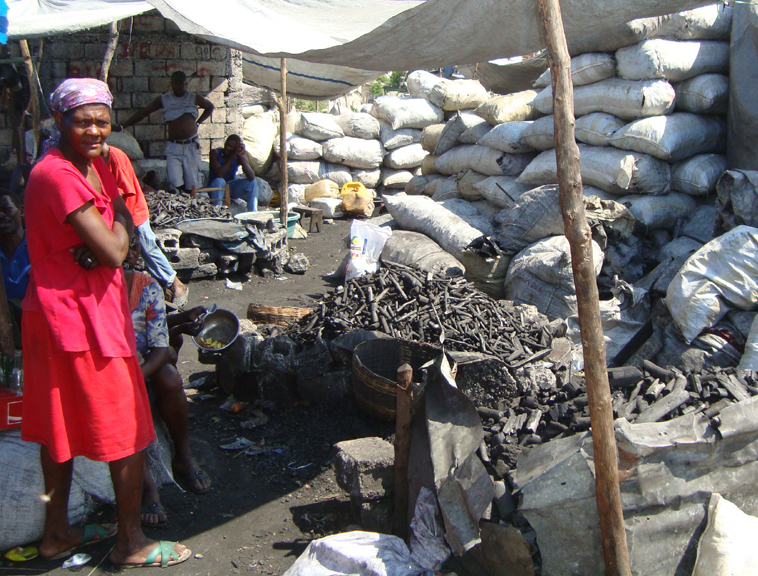 In their research and filming Jake Kheel and his colleagues revealed the interlinked importance of many features – poverty, lack of legitimate employment, national and ethnic difficulties, unscrupulous business, weak institutions, etc., and the terrible trap of Haitian dependence on charcoal for cooking. The film was shown to a packed house as part of the DC Environmental Film Festival, and will soon be seen in the Dominican Republic Environmental Film Festival. 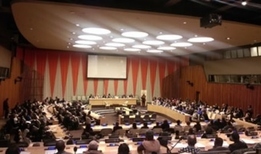 Plans are underway for viewings in Haiti and elsewhere, including at the United Nations. In the July 28 discussion it was well understood that efforts to address the issues need to come from both sides of the border. The meeting took place at the offices of the Global Foundation for Democracy and Development – a high-level Dominican organization - and included representatives from the Global Alliance for Clean Cookstoves, the non-profit “A Dollar a Tree for Haiti,” the film production team and PPAF. Haiti. Click here for a link to that program. It includes a summary and a five-page FAQ..
end of 2016. Canada is interested to provide significant funds to support the plan for five years starting in January 2017.
create awareness of the complex situation, and to promote steps toward solutions. June 6, 2016: UNAI START: "Our Envir. & Our Health: Science and Solutions"
On the occasion of World Environment Day, this half-day conference at the United Nations Headquarters in New York City brought together policy makers as well as scientists for a panel that discussed the correlation between our health and our environment. Invited speakers addressed various topics including Children's Environmental Health, the Health Effects of Dust and Destruction, Metals and the Global Food Supply, as well as Cardio Vascular Disease and Air Pollution. A concluding message was given by Executive Director David Stillman on PPAF's efforts in Haiti after the earthquake, focused on improving air quality and women’s and children’s health, mitigating deforestation and encouraging small business. The United Nations Academic Impact (UNAI) held this symposium as part of their START series (Skills and Technology Advancing Rapid Transformation), a series that uses research and science to address worldwide issues, with a large focus on global health. For more information on UNAI and their support of UN goals, please click here. May 18, 2016: Catherine Flon Symposium: "Cultivating Innovation, Entrepreneurship"
The National Alliance for the Advancement of Haitian Professionals (NAAHP), and the Danielle Saint-Lot Haiti Women’s Foundation (DSLF) presented the Catherine Flon Symposium: Cultivating Innovation, Entrepreneurship and Economic Empowerment. The conference involved two lively and interactive panel discussions: "Bridging the Gap-How to Fill the Missing Middle" as well as "Innovation, Entrepreneurship, and How to Contribute and Help Promote Women's Economic Empowerment." The event served to simultaneously honor Catherine Flon, one of the symbols of the Haitian Revolution and independence, and celebrate Haitian Flag day on May 18th. The symposium convened over 150 participants which included public and private sector leaders, entrepreneurs, investors, professionals, and friends of Haiti to explore and create more opportunities for "female entrepreneurship enhancement" in Haiti. 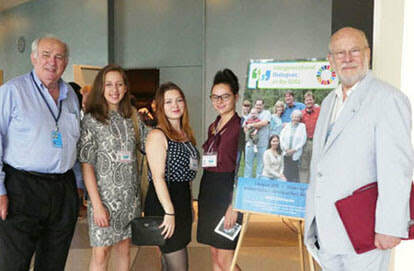 Executive Director David Stillman and current intern, Natalie Araya, attended the event at the UN Trusteeship Council Chamber at the United Nations Headquarters in New York City. For more information, see the attached agenda below. PPAF participated in the “Give Local - Westchester & Putnam Counties” online fundraising event, sponsored by United Way. We emphasized how PPAF involves interns and mentors students, giving them an opportunity to learn about global issues and sharpen their skills. They translate, create videos, participate in social media, facilitate meetings (often at the UN) and contribute to project work. They learn about empowering women and girls, increasing jobs to reduce poverty, sustainable environment and climate issues, and development of ethanol cookstoves and fuel to reduce health problems and deforestation. PPAF's Go Fund Me campaign was a success. The owners of Resource Furniture gave a challenge grant which other donors matched and exceeded. We are grateful for the generosity of all. In Haiti charcoal and wood are the main fuels for cooking. These are a poverty- respiratory disease-deforestation trap. To help overcome this, PPAF, with D&E Green, a Haitian manufacturer, have designed and tested a locally-made, low-cost stove that burns high-proof Haitian sugar cane ethanol for fuel. Donor support will now enable us to provide advice to several distilleries, and provide equipment for a pilot and demonstration site for ethanol fuel. Click to donate! 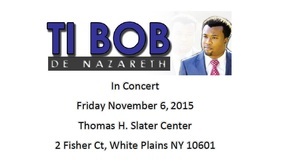 November 2015: Fundraiser for the Haitian Resource Center, White Plains, NY. Volunteers of the Haitian Resource Center worked with PPAF on English-Kreyol translations that assist our Haiti ethanol cookstove project. See below for a flyer on a Gospel Choir concert on November 6 to benefit the work of the Haitian Resource Center. 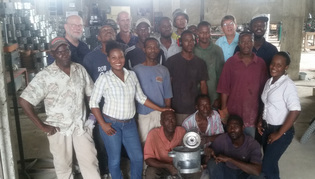 Tom Setchel, Senior Fellow/Energy Consultant traveled to Haiti to work with guildive owners and with D&E Green Enterprises staff on development of local production of ethanol and on results of ethanol stove testing. His findings will help shape our business plan for the future. The Inter-American Development Bank invited PPAF to present its current work at a forum on Sustainable Cooking in Haiti. Held in the IDB office in Port-au-Prince, about 40 people attended including the director of Haiti's Bureau of Mines and Energy. PPAF and D&E Green made a joint presentation on development of the Recho EcoVit ethanol cookstove. See the full agenda below. The United Nations Environment Programme awarded PPAF a grant in May 2015, to expand our work in Haiti on Ethanol Cookstoves and Fuel. 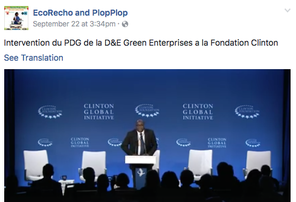 Since 2014 PPAF has worked with D&E Green Enterprises, an award-winning Haitian company that manufactures and sells "improved" cookstoves that burn less charcoal or wood than traditional stoves. The grant enables PPAF and D&E Green to refine the design of the new ethanol stove, test it with potential customers, and develop a business plan for commercial rollout. PPAF personnel visited Haiti in late May to get this stage of our work underway. Since then, the partners have carried out a kitchen use test, developed marketing materials, and administered surveys concerning stove use. Working with women is an important component- in the refinement, testing and entrepreneurship phases. Women make up 75% of D&E's 100 stove distributors. A PPAF team will work with D&E Green in September to carry out the second kitchen test and improved stove and to take steps toward the development of a business plan. This event was associated with the UN Commission on the Status of Women and held in cooperation with the Nations Association Southern NY State Division. Speakers addressed the following: "Reinforcing Beijing: The Convention on the Rights of the Child and CEDAW"
"Start from the Very Beginning: Transforming the Goals and Strategies of the Beijing Agenda through a focus on girls"
"Young Professionals World Health Summit: Cultivating the next generation of World Health Leaders"
See the file below for speakers and details. 6:15-8:15 pm UN Foundation Conference Room, 801 Second Ave., 9th Floor (Manhattan). This event was associated with the UN Commission on the Status of Women and held in cooperation with the United Nations Association Southern NY State Division and its Energy Project. 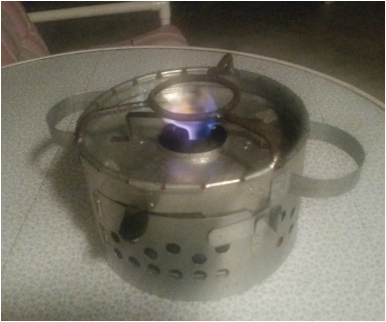 "New Approaches to Financing for Energy"
"Ethanol Cookstoves and Fuel in Haiti- Recent Updates"
"Community Biogas Generation as a Keystone for Women's Empowerment"
Check out the new ethanol stove designed by PPAF and its partner, D&E Green Enterprises. The improved prototype was created with your financial assistance and made ready for a first run in 2015 of manufacture and testing with a pilot group of families! From November 18-21 2014, the Permanent Mission of Madagascar to the UN hosted business people and association leaders who brought Malagasy products and handicrafts, including silver jewelry with semi-precious stones, homeopathic preparations including essential oils, designer necklaces, coffee, tea and spices, denim clothing and small goods, exquisitely embroidered linens, basketry, and table goods made of horns. Details on the seven companies can be found here. PPAF thanks all who donated to our fundraising effort for Phase I of a project to test and evaluate newly designed ethanol cookstoves in Haiti. Donors met and exceeded the challenge grant given by the owners of Resource Furniture. 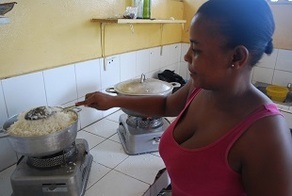 This supported a trip to Haiti by a PPAF team in October 2014 who worked with the Haitian Company D&E Green Enterprises and with the International Lifeline Fund to build and test stoves and to carry out studies with local women about their cooking practices and preferences. Resource Furniture has also linked to our website. To learn more about their philosophy and support, including to PPAF, click here. August 29, 2014: "Energy and Climate Action: Essential Tools for the Post-2015 Agenda"
The UNA-USA Southern New York State Division (UNA-SNY) and its Energy Project were co-sponsors, along with the United Nations Association of the USA, the NGO Committee on Sustainable Development and the Batey Relief Alliance. The full conference, August 27-29 in New York, drew over 3,000 participants. Moderated by David Stillman, the panelists included: (1) Tapio Kanninen, PhD, "Crisis of Global Sustainability," (2) George Garland, DBA, "Climate Policy: The U.S. and the UN," (3) Amy Parekh Mehta, Esq. "Climate Change and Energy Issues as seen in the Sustainable Development Goals," (4) Vadim Belikov, MA, "Involving Social Entrepreneurs for Solutions in Energy and Climate Action." The Foundation worked with the UN Department of Public Information to host a lively and well-attended panel discussion on the 13th at the UN. Panelists explored the interconnections between bio-energy policy, clean cook-stoves and ways to improve creation of alcohol (ethanol) for cooking. Click here for an archived video of the program: UN WebTV archived video. Jeff Brez, Chief, DPI/NGO Relations and Advocacy, introduced the program, which opened with a Global Alliance for Clean Cook-stoves video narrated by actress Julia Roberts. David Stillman, PPAF Executive Director, moderated the program. Panelists included: (1)Kathryn R. Leininger, Business Development Manager JMConsulting, (2) Corinne Hart, Program Manager, Gender and Markets Global Alliance for Clean Cookstoves (See the Alliance's new resource guide: ﻿﻿﻿Scaling Adoption of Clean Cooking Solutions through Women's Empowermen﻿t﻿﻿), and (3) Thomas Setchel, Energy Conservation and Distillation Specialist, Sustainable Technology Systems Inc.
January 2014- "PPAF Accredited to UN Economic and Social Council"
We are happy to announce that at its January meeting, the UN Committee on Non-Governmental Organizations approved the Public-Private Alliance Foundation as an accredited NGO in consultative status with the Economic and Social Council. Consultative status provides NGOs with access not only to ECOSOC, but also to its many subsidiary bodies, to the various human rights mechanisms of the United Nations, and ad-hoc processes on small arms, as well as special events organized by the President of the General Assembly. PPAF teams worked in Haiti from September 15 through the 23rd, and again from October 19 through the 27th, 2013. 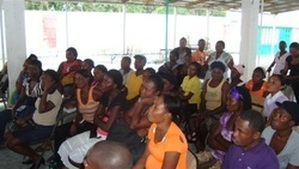 They met with Inter-American Development Bank officials, government officials, farmers and distillers and community organizations including women's groups in Leogane, and several organizations in Jacmel. The teams focused on use and testing of cookstoves, research on existing practices in distilleries and their potential for increasing production of high-proof ethanol, and on market studies for ethanol cookstoves and fuel. David Stillman participated in the Workshop to Develop a National Energy Action Plan for Haiti on December 10 at the invitation of the Inter-American Development Bank. He presented the findings of a consultancy undertaken for the Bank from September to November 2013. PPAF has continued field testing comparing ethanol and charcoal stoves in Jacmel, Haiti and analyzed data from tests in earlier months. Thank you again to the Art Creation Foundation for Children for collaborating with us. PPAF Intern Nithin Paul, a student at Thomas Jefferson Medical School, conducted a controlled cooking test of ethanol stoves in comparison with traditional charcoal stoves. This test focused on cooking of rice for five people and for ten people. Rice is a main food for about 70% of Haitian families who eat it daily, often together with beans in the dish called diri ak pwa or diri ak sos pwa (rice with bean sauce). 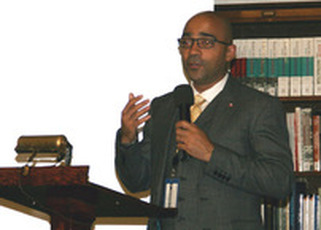 On June 17, at the invitation of the Ambassador of the Dominican Republic to the UK, Federico Alberto Cuello Camilo, PhD, David Stillman spoke at the Tenth Roundtable on the Dominican Republic and Haiti. 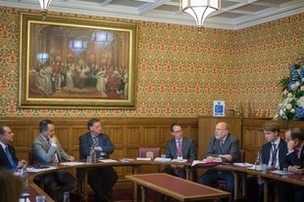 This was held at the Houses of Parliament in London. Revd. Lord Leslie Griffiths, Chairman of the All-Party Parliamentary Group for Haiti, presided over this open session of the two All-Party Groups. The round table addressed innovations for increasing environmental sustainability in the DR and Haiti. Government, business and NGO community representatives attended. The Vice-Minister of Foreign Affairs of the Dominican Republic, H.E. Jose Manuel Trullois, offered opening remarks. Nick Harvey, Senior Resiliance Adviser and leading on the Political Champions for Resiliance, Department for International Development (DFID), UK, spoke on “The Political Champions Initiative for Disaster Risk Reduction” recently begun in relation to Haiti and several other countries. Stillman spoke on “The PPAF Ethanol Stove Project” and its work involving Path to Haiti Business Consulting LLC, Project Gaia Inc, and others, and with cookstoves from Dometic Group AB fueled by high-proof alcohol from the Association of Farmers and Distillers of Leogane. Participants at the meeting had questions and exchanges of ideas with all speakers. It being “Dominican Week in the UK”, Stillman was invited to a panel discussion hosted by the Embassy on the 17th at the University College of London - Institute of the Americas. Speakers included Dr. José del Castillo, Dominican Minister of Industry and Trade, Mr. Kai Schoenhals, President of the Dominican Association of Exporters, and Ambassador Cuello. This focused on branding the DR as “The Hub of the Americas” and increasing investment and trade relations with the UK. A highlight was that week’s inauguration of Indomina Pinewood Movie Studios, just outside Santo Domingo. 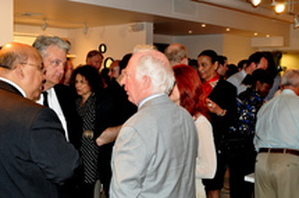 On the 18th, Stillman took part in “An Evening of Dominican Cigars, Music and Rum,” which again focused on promoting Dominican – UK relations. 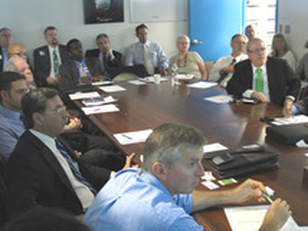 Following our successful Consultation on Ethanol Cookstoves and Fuel at the United Nations in April, PPAF organized a meeting at the UN Foundation office of the Global Alliance for Clean Cookstoves in Washington, to bring together representatives of organizations who could not come to New York. 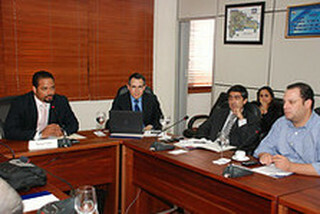 Among those represented were the Brazilian Sugarcane Industry Association (UNICA), the International Lifeline Fund, the Roundtable on Sustainable Biomaterials, the UN Environment Program, the US Agency for International Development as well as the Global Alliance for Clean Cookstoves, Path to Haiti Business Consulting LLC and board members of PPAF. PPAF started the meeting with its new video. The discussions focused on the work of the various organizations and on how they could be helpful to expansion of ethanol cookstoves and fuel in Haiti. PPAF and Path to Haiti representatives also met with staff of the Inter-American Development Bank and with the Director of the US Cookstoves Initiatives in the Office of the Secretary at the U.S. Department of State. The Public-Private Alliance Foundation held a Consultation on Ethanol Cookstoves and Fuel on April 4 at the United Nations, sponsored by the UN Office for Partnerships and others. 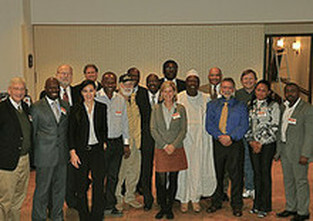 An article on the event appears in the April 2013 Update from the Global Alliance for Clean Cookstoves. PPAF, Path to Haiti Business Consulting LLC, SImACT Inc. and other partners are currently conducting a pilot project toward commercialization of these ﻿stoves﻿ and ethanol supply. It is the first project of its kind in Haiti. Dometic Group AB manufactures the stoves and Project Gaia, Inc. has donated an initial supply to this project. 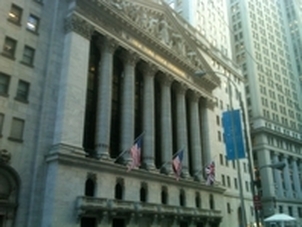 The Consultation was held in the Economic and Social Council Chamber. (2) to promote the benefits and possibilities of ethanol cookstoves and fuel in Haiti and elsewhere. 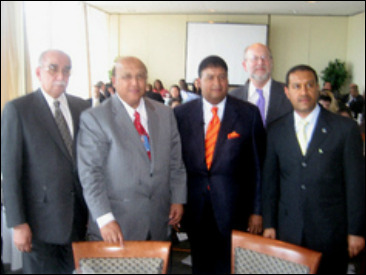 Seventy people participated, including technical specialists, policymakers, community representatives, UN and government officials, diaspora members, non-governmental organizations and other stakeholders including members of the UN Association of the USA Southern New York State Division, which supported the event. Brief presentations by a series of key people provided background and content for working groups which discussed stoves, fuel and distillation, distribution, financing and awareness. The Consul-General of Haiti thereafter invited a small group to meet with him in the afternoon. At the breakfast held at the Church Center for the UN, David Stillman updated the group on piloting cookstove and fuel alternatives in Haiti, focusing on ethanol from sugarcane as a way out of the poverty-disease-deforestation trap of reliance on charcoal for cooking. 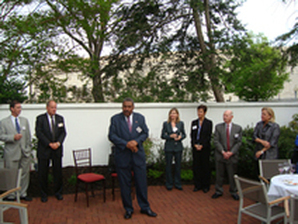 In 2012 the New York Rotary Foundation provided a grant to the Public-Private Alliance Foundation for this. The work is the first of its kind in Haiti, and several important steps have recently been accomplished. Meetings of the PPAF - Path to Haiti team in January in Leogane and Jacmel with current stove users, farmers, distillers and others resulted in the start of fuel purchases by project participants (replacing fuel donations); establishment of several sales points for fuel; and confirmation of experiences and satisfaction among current stove users. 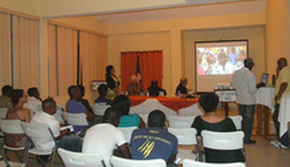 PPAF presented at the January 12, 2013 commemoration of the 2010 Earthquake in Haiti. PPAF's PowerPoint presentation, a Dometic cookstove provided by Project Gaia and a typical Haitian charcoal brazier were on exhibit for much of January at the James Jay Dudley Luce Foundation, 1149 Second Ave. (at 61st St.) in Manhattan. 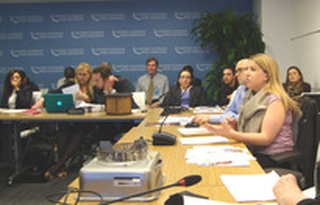 The UN and Global Affairs Committee hosted a presentation on the Foundation's work in Haiti. 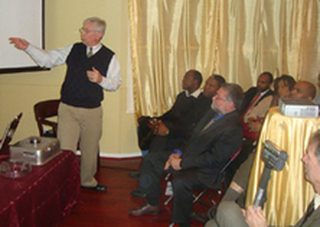 George Garland, PPAF Board Member, and David Stillman, spoke to an audience of more than 70. The PPAF - Path to Haiti team met with the Association of Farmers and Distillers of Leogane and representatives of 28 women’s and other civic organizations to introduce use of ethanol cookstoves and fuel. The project team established support teams for distribution of fuel and monitoring of stove use. The cookstoves (manufactured by Dometic Group and provided by Project Gaia, Inc. to initiate the project) have now been seen by hundreds of people. At the Westchester Chapter UN Day event “Sustainable Energy for All: Solutions for a Prosperous World” speakers were Nikhil Seth, Director of the Division for sustainable Development of the UN Department of Economic and Social Affairs and Elizabeth Silleck, Regional Coordinator for the Energy $mart Communities Program, an outreach project of the New York State Research and Development Authority (NYSERDA). The event was co-sponsored by NYSERDA’s Energy $mart Communities Program and the Energy Project of the UNA Southern NY State Division. 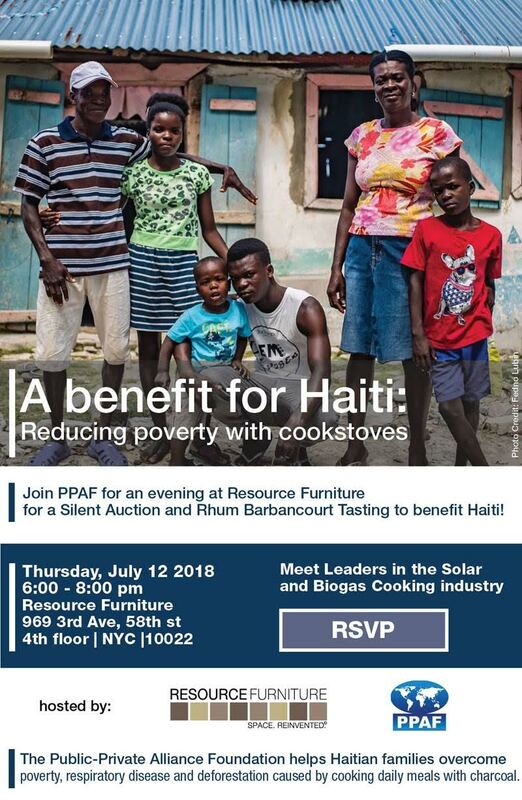 Resource Furniture in Manhattan hosted our very successful Partners Against Poverty Benefit, featuring our Haiti Alternative Cookstove and Fuels Initiative. To view photos and the set Partners Against Poverty, check out our Flickr. Thank you to all who attended, participated and supported this event. An article announcing the event appeared in Amour Creole Magazine. 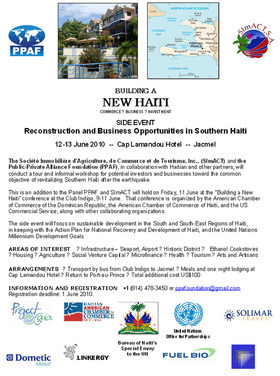 (SimACT Foundation and Path to Haiti Business Consulting LLC) launched the Haiti Alternative Cookstoves and Fuels Initiative with an opening event and reception hosted by SimACT's Cap Lamandou Hotel. Members of the business and arts communities and others attended. In September the project team (David Stillman and George Garland of PPAF and Fritz Clairvil of SimACT Foundation and Path to Haiti Business Consulting LLC) began the pilot work in Haiti with a selected group of mothers of children enrolled at ACFFC, a well-regarded artisans training school in Jacmel. Each woman received cookstoves made by Dometic Group and provided by Project Gaia, Inc., and were trained in their use and safety. PPAF purchased pharmacy grade 95 percent alcohol (190-proof), distilled from local sugar cane. PPAF established a monitoring team and initiated questionnaires for tracking experiences in shifting from charcoal to ethanol fuel. 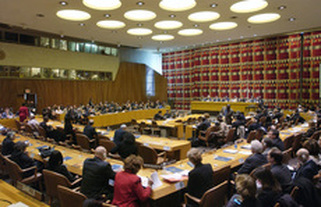 On July 24, 2012, Ambassador Guillermo Rishchynski (Canada), chair of the ECOSOC Ad Hoc Advisory Group on Haiti, introduced the Group’s report and a resolution to the Council. The report provides the latest overview of the country’s reconstruction following the devastating 2010 earthquake. Main topics covered include (a) Continued need for strong and coherent development support to Haiti, in a changing environment; (b) Mobilizing Haitian stakeholders for development; and (c) Rule of law as a component of and a condition for development support. 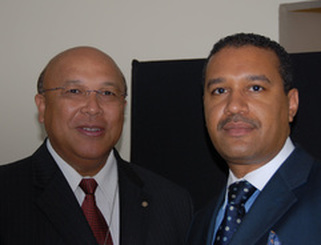 Gauthier (featured in above photo) was at that time Haiti's Minister of Planning and External Cooperation. For more information, see the Blog posting. 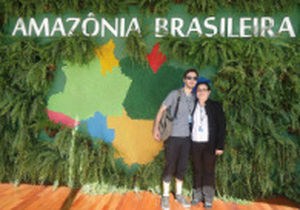 PPAF was represented in Rio by Pedro Vicente, Ana Carolina Magalhaes and Julia Ewing. They attended meetings, interviewed people and photographed conference sites. PPAF is a member of the Global Alliance for Clean Cookstoves, the UN Global Compact, and the Global Gender and Climate Alliance, which hosted events at the conference. 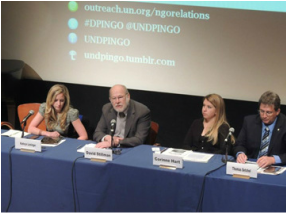 In New York, David Stillman and intern Nina Wineburgh joined several UN Association of the USA members in following the livestream of the Rio+Social Conference and tweeting, blogging and reporting on its progress. Other PPAF colleagues worked from their homes, offices or schools. Next steps are to organize follow-up meetings on the conference Outcome Document and to participate in development of the proposed Social Development Goals that are to start in 2015. At the June 18 meeting of the Rotary Club of New York, President Giorgio Balestrieri presented a Certificate of Merit to the Public-Private Foundation for its service in contributing to the fulfillment of Rotary's Objectives in New York City. This includes thoughtfulness of and helpfulness to others, high ethical business and professional standards, community betterment, international understanding and good will. At the June 4 meeting of the Rotary Club of New York, at its Italy Day Celebration, the Club's Foundation presented a grant of $5,000 to the Public-Private Alliance Foundation to advance the work on clean cookstoves and cooking fuel alternatives in Haiti. This grant is part of a long-standing interest and involvement by members of the Club in the work of PPAF since its early roots in the United Nations. 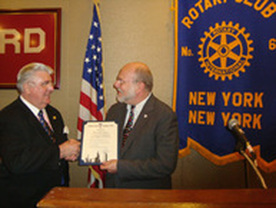 Pictured above: Giorgio Balestrieri, Rotary Club President, David Stillman, The Hon. 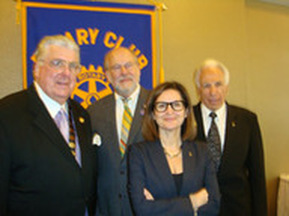 Natalia Quintavalle, Consul General of Italy in New York, and Paul Caruso, Rotary Club Foundation Chair. March 28, 2012: Rotary Club of Wall Street: "Public Private Alliance Foundation"
Executive Director David Stillman spoke about the work of the Public-Private Alliance Foundation at a Rotary Club of Wall Street event held at the Downtown Association, NYC. He focused on "How can we make a difference in helping Haiti rebuild," with special emphasis on the clean cookstoves and clean fuel project. March 27, 2012: UNA-SNY Young Professionals: "Renewable Energy and Policy in the EU and the US"
The European Affairs Committee of the UN Association of the USA Southern New York State Division organized this event, held at the Austrian Cultural Forum in New York. Speakers included Mr. Marty Borruso of Medesco, LLC., a PPAF Senior Fellow and Dr. David Stillman, PPAF's Executive Director. Others included Mr. Christopher Gadomski of Bloomberg New Energy Finance, Mr. Trey Taylor of Verdant Power, Inc.; and Prof. Johannes Urpelainen of Columbia University. For more, click: "Renewable Energy and Policy in the EU and the US"
March 19, 2012: Rotary Club of New York: "2012: The Year of Energy"
The Rotary Club of New York organized the event "2012: - the International Year of Sustainable Energy for All" , held at the General Society of Mechanics and Tradesmen in New York City. Cdte. Giorgio Balestrieri, President of the Club, and a PPAF Senior Fellow, opened the program, which David Stillman chaired. Dr. George Garland, PPAF Board member, spoke on "International issues and the 2012 Year," Mr. Marty Borruso, PPAF Senior Fellow, spoke on "The Future Belongs to the Efficient," and Stillman spoke on the Foundation's Clean Cookstoves and Clean Energy project in Haiti. Mr. Charles Forbin, Consul General of Haiti in New York, (photo above) gave remarks. Videos of the evening are available on the PPAF YouTube site. March 6, 2012: UNA-SNY: "Rural Women: Energy, Health, and Water"
A Side Event to the UN Commission on the Status of Women, “Rural Women: Energy, Health and Water” was co-sponsored by the UNA Southern NYS Division's Energy Project, the UN Foundation and PPAF and held at the UN Foundation's New York office. Speakers included Dr. George Garland, Director of the Division’s Energy Project and PPAF Board Member; Ms. Corinne Hart, Program Manager, Gender and Markets, Global Alliance for Clean Cookstoves; Dr. David Stillman, Executive Director, PPAF; Mrs. Marcia Brewster, Senior Consultant; and Dr. Padamini Murthy, NGO Co-Representative to the UN of the Medical Women’s International Association. Videos of the presentations are available on the UNA-SNY YouTube channel. January 18, 2012: Rotary Club of New York: "2012 International Year of Sustainable Energy for All"
PPAF Board member Dr. George Garland spoke at the Rotary Club of New York International Breakfast, held at the Church Center to the UN. Garland spoke about international and domestic energy issues in relation to the 2012 International Year of Sustainable Energy for All. 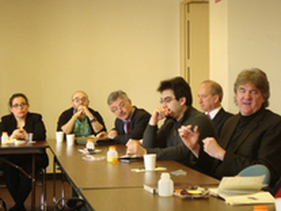 November 14, 2011: WAFUNIF: "The UN and Sustainable Development"
David Stillman gave the keynote address to the General Assembly of the World Association of Former UN Internes and Fellows (WAFUNIF), held in their office at the UN. The event was livestreamed to their members worldwide. Many children now can hear! PPAF board members Ambassador Zina Andrianarivelo and Scott Wright, along with Senior Fellow John German and staff of the Madagascar Mission worked hard to make this come about. 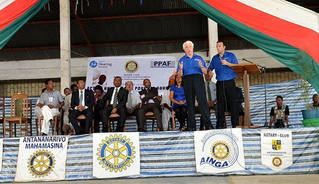 The Starkey Hearing Aid Foundation, the Madagascar Ministry of Public Health, three Madagascar Rotary Clubs (Doyen, Mahamasina and Ainga) and their associates, and several corporate sponsors combined efforts on the ground. 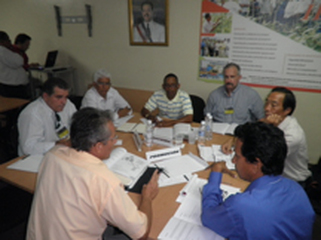 The Ministry of Budget and Finance and the city governments of Antananarivo and Tamatave facilitated the work. The event took place under the patronage of the President of the Transitional Authority of Madagascar. Executive Director David Stillman, Foundation Board Member George Garland, and Senior Fellows Eben Bronfman, Giorgio Balestrieri and Project Gaia representatives Harry Stokes, Brady Luceno, and Gulce Askin, participated in the one-year Anniversary Celebration of the creation of the Global Alliance for Clean Cookstoves. This was hosted by the UN Foundation and Dow Corning at the Waldorf Astoria Hotel, NYC. 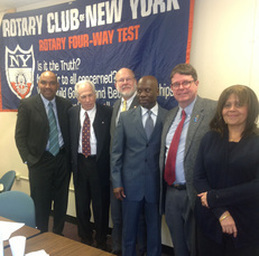 David Stillman arranged for Ambassador Jean Wesley Cazeau, Ambassador of Haiti to the UN, to speak at an international breakfast of the Rotary Club of New York, held at the Church Center to the UN. Stillman moderated the meeting and also made a presentation on the PPAF ethanol stove and fuel project. Working with the UN Office for Partnerships, PPAF organized this meeting at the UN. It followed on the June 2 meeting convened by UN Energy and the private sector. Dr. David Stillman opened and moderated the session. Presenters included BioGen (Dominican Republic and U.S.), Medesco (U.S.), Habitech International (U.S. and Dominican Republic), WECAN, Inc., and Project Gaia (U.S., Ethiopia and Brazil). A presentation was also made on Viridian Energy, whose program for non-profits can benefit our Foundation. 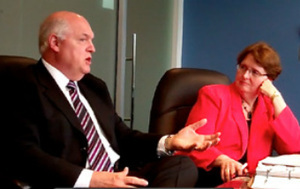 Board Members George Garland, Scott Wright and Jeanne Betsock Stillman participated as did Senior Fellow Judith Bowman. 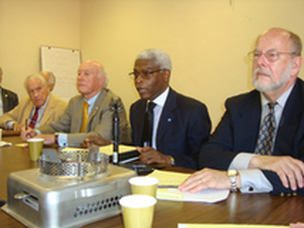 Michael Ambrozek and John E. Stillman served as senior consultants to the meeting. The e8 and UN-Energy, with many partners launched the global initiative for “Strengthening Public-Private Partnerships” to advance sustainable energy development at the above meeting. PPAF board members, Senior Fellows, colleagues and a number of those invited to participate in PPAF's June 3 meeting attended. The focus was to identify effective and meaningful partnerships that support and promote the global deployment of low and zero-emitting electricity technologies at country, regional and global levels. The e8 and UN-Energy had conducted a global survey and analyzed case studies highlighting the enabling policies and best practices of public-private partnerships. Role of public-private partnerships best practices to effectively establish energy policies; Importance of long term stable policy frameworks to meet goals; and Integration of partnerships into electricity & energy services development. 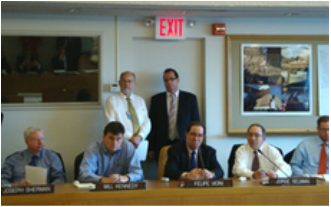 This panel served as a side event to the UN Commission on Sustainable Development, held at the United Nations. The Pueblo Viejo Dominicana mine in the Dominican Republic was a special focus. PPAF invited Jean-Marie Wolff, president of SImACT Mining Holding Inc., who joined David Stillman and George Garland at this event. SImACT controls a property in Haiti with both gold and copper potential. PPAF Board VP Francis Lorenzo organized the meeting on behalf of FUNGLODE (The Global Foundation for Democracy and Development) and the Dominican Government. 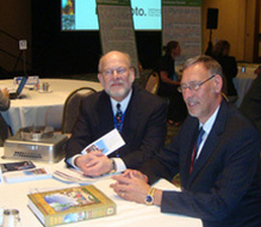 David Stillman was an invited speaker at the Summit, held in Orlando, Florida. He presented the work of the Ethanol Cookstove Initiative for Haiti and related PPAF activities, and hosted a table for discussions with business and non-governmental representatives. 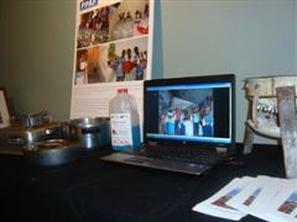 PPAF collaborated with the Haitian-American investment group SImACT for 50 of its members and others to participate in discussions in Brooklyn with Harry Stokes (Project Gaia) on ethanol cookstoves and David Blume (Blume Distillation, LLC) concerning the opportunities for clean cookstoves and community distillation in Haiti. David Stillman was a panelist on sustainable development at this conference, hosted by the Committee for Teaching About the UN, which had about 500 participants. 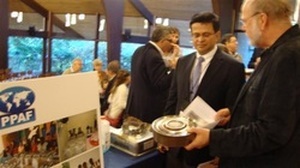 He spoke about ethanol cookstoves for Haiti, in the context of steps toward achieving the Millennium Development Goals. 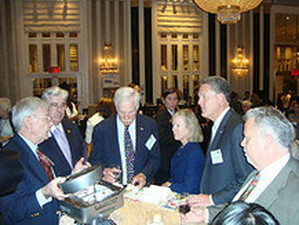 Stillman arranged for Harry Stokes of Project Gaia and David Blume of Blume Distillation LLC and Fritz Clairvil of SImACT to host a table at the conference. 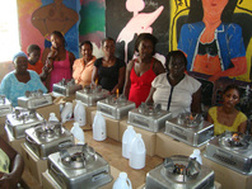 In Haiti, PPAF, SImACT, Project Gaia and their partners continue to develop the clean cookstoves project. The meetings with IIEA and the Alcohol Fuel Production International Forum helped move this forward. David Blume, founder of IIEA and Blume Distillation, LLC ran the seminar in two days of lectures plus Q&A. 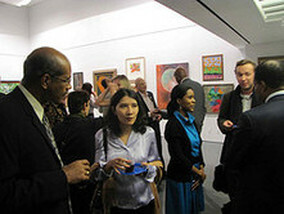 PPAF held its “Partners Against Poverty” Benefit at Affirmation Arts, in Manhattan Affirmation Arts featured an exhibition, “Saving Grace: A Celebration of Haitian Art.” It included works by many of the best artists of the Haitian Renaissance and was curated by Gérald Alexis, a historian of Haitian art. Noted actor and director Tony Plana hosted the event. He recently played the father on Ugly Betty, on ABC TV, and has starred in over 70 movies and on Broadway. Ian Williams, past president of the United Nations Correspondents Association, spoke about his book, Rum: The Social and Sociable History of the Real Spirit of 1776. Other speakers included Lesly Kernisant, president of SImACT, Inc., Jocelyn McCalla, Office of Special Representative of Haiti to the UN, and David Stillman, PPAF's executive director. June 12-13, 2010: "Reconstruction and Business Opportunities in Southern Haiti"
PPAF and SImACT held their Jacmel Workshop “Reconstruction and Business Opportunities in Southern Haiti” at the Cap Lamandou Hotel. This took place at a time of great crisis but also great opportunity. “Refondation” will take many years and billions of dollars. Yet the cry is to “build back better,” and investment, commerce and business have central importance in this. 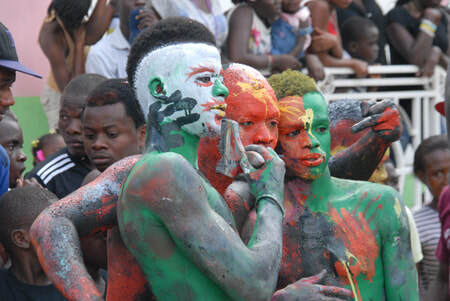 About 120 participated, including 70 potential investors and contractors, the Minister of Tourism, the mayor and the president of the local chamber of commerce of Jacmel and other notables. 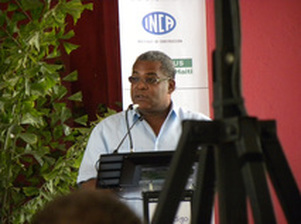 The event focused on areas of development and business including agriculture, infrastructure including seaport and airport, ethanol cookstoves, energy, housing and construction, distribution, tourism, transportation / logistics, the Historic District of Jacmel, social venture capital, healthcare, education, microfinance and art & artisans. 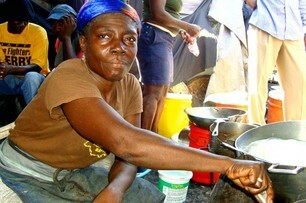 Article: Jacmel Woos Foreign Investors to Help Rebuild Shattered Resorts. About 600 people attended the “Building A New Haiti” Conference organized by the American Chambers of Commerce of the Dominican Republic and Haiti and the U.S. Commercial Service. 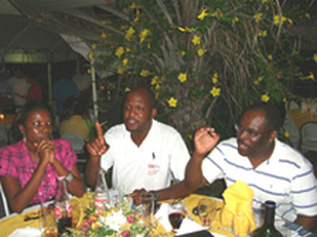 Speakers included the Haitian President Rene Preval and the Prime Minister, Max Bellerive. David Stillman of PPAF and a team from SImACT attended, with Lesly Kernisant making a presentation in the Tourism segment. About 50 who attended the AMCHAM conference followed up by participating in the Foundation and SImACT's Conference in Jacmel. David Stillman and colleagues including Dr. Lesly Kernisant, President, SIMACT, Inc., Harry Stokes and Brady Luceno of Project Gaia, and Regine Barjon of the Haitian-American Chamber of Commerce of Florida and New York attended the Haiti Reconstruction Business Dialogue at the U.S. Department of Commerce. This featured U.S. Commerce Secretary Gary Locke and Haitian Minister of Tourism (and reconstruction) Patrick Delatour as the keynote speaker. Robert Jones, U.S. Commercial Services Regional Senior Officer for the Caribbean, was emcee. Meetings afterward included a reception held by MercyCorps to honor Delatour and a dinner with Haitian and Haitian-American colleagues. 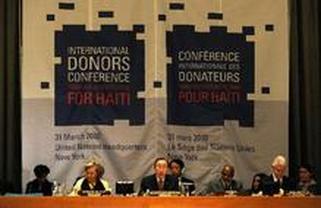 The United States and the United Nations (UN), in cooperation with the Government of Haiti, and with the support of Brazil, Canada, the European Union, France, and Spain, co-hosted the “International Donors’ Conference Towards a New Future for Haiti” at the United Nations in New York on March 31. Co-Chairs were UN Secretary-General Ban Ki-moon, U.S. Secretary of State Hillary Rodham Clinton, and Haiti President René Préval. The goal of the donors conference was to mobilize international support for the development needs of Haiti in an effort to lay the foundation for the country’s long-term recovery. PPAF's David Stillman had the good fortune to speak briefly with President Clinton at the conference about ideas developed during Stillman’s recent trip to Haiti. The Dominican Aquaculture Association (ADOA) and its partners held a workshop on “Estrategias para el Desarrollo de la Acuicultura Dominicana 2010-2015. "The workshop focused on achievements of the earlier strategic planning process and worked to develop a new strategic plan for 2010-2015. The Organizing Committee was composed of a representative from each of the following institutions and agencies: IDIAF, CONAPROPE, ADOA, CODOPESCA, FAO-RD, University ISA and the TAIWAN Mission. The Public-Private Alliance Foundation co-sponsored the event and arranged for the participation of Dr. James Tidwell of Kentucky State University, a past president of the World Aquaculture Society. The workshop included groups on research, training, finance, marketing, promotion, and quality control. 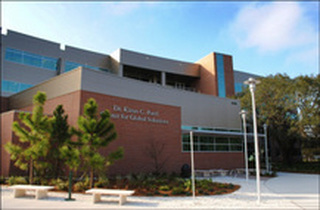 Invited by the Kiran G. Patel School of Global Sustainability (photo above), David Stillman briefed the USF community on sustainable development and renewable energy in Haiti, the Dominican Republic and other developing nations. Stillman said alternative energy can be built into Haiti’s new infrastructure, creating jobs and a sustainable economic base for the impoverished nation. “Renewable energy is needed and is possible in various ways at various levels,” he said. 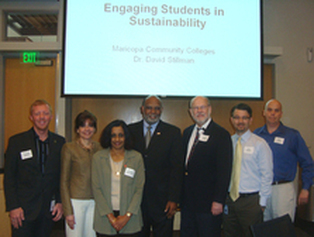 Stillman’s presentation was part of a continuing focus the Patel Center has on renewable energy projects in the region. In addition to a plenary discussion with students and the community, he was guest lecturer at a class and met separately with faculty members. 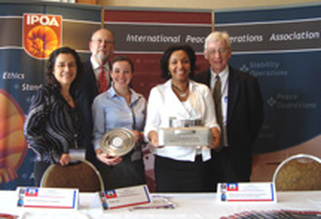 The "HAITI – Resources for Reconstruction & Humanitarian Assistance Summit," was held March 9 and 10, 2010 in Miami. The event stressed the pivotal role the private sector will play in Haiti's long-term reconstruction. PPAF Executive Director David Stillman was an invited speaker in the panel on Economic Recovery and Reconstruction and hosted one of the afternoon discussion tables where conference participants could sign up to discuss business or humanitarian support related to reconstruction priorities. The event was organized by Global Investment Summits and the International Peace Operations Association (IPOA). Its aim was to enable participants to begin addressing the efforts required to reconstruct Haitian infrastructure and rehabilitate the country’s economy and society. The summit aimed to contribute to work in the fields of logistics, transport and communications, infrastructure, housing, security and stability, and medical and nutritional aid. PPAF Executive Director David Stillman met with Maximo Nicolas, President of the Dominican Aquaculture Association (ADOA) and others in the D.R. in January 2010 to discuss achievements and plans for fish farming in the country. Dr. James Tidwell, Chair of the Aquaculture Program at Kentucky State University, and past president of the World Aquaculture Society, participated. The team included Bill Miller and Dan Mizroch, former Peace Corps Volunteers in the D.R., who have long maintained connections there. 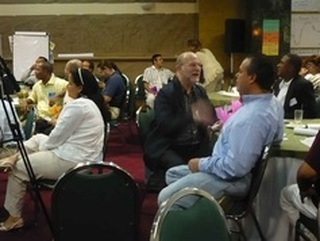 ADOA and its partners were planning a workshop for March 2010 called “Estrategias para el Desarrollo de la Acuicultura Dominicana 2010-2015," to focus on achievements of the earlier strategic planning process and needs going forward. The group met with the Dominican Institute for Agriculture and Forestry Research (IDIAF), the Dominican Center for Agriculture and Forestry Development, Inc. (CEDAF), and the U.S. Peace Corps. 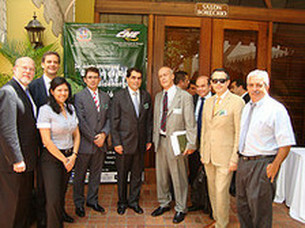 As a follow-up to the October meetings on Bioenergy in the Dominican Republic, the National Energy Commission (CNE) as host and leader, the Public-Private Alliance Foundation and ResearchPAYS, Inc. benefited from collaboration and sponsorship from the Ministry of Foreign Affairs, the RJS Group, S.A., and the United Nations Office for Partnerships (UNOP). The December discussions expanded upon the recommendations reached at the introductory session held in Santo Domingo in early October. The meetings brought out the views of the public sector, the financial community, companies with pilot field experience, and academics & the private sector generally — over 55 people in total. The Public-Private Alliance Foundation (PPAF) and ResearchPAYS, Inc., organized the Third International Debate on Bioenergy – Risk Management and Business Model Innovation. Hosted by the Ministry of Foreign Affairs and the National Energy Commission (CNE), the event brought together leaders from the government, business, financial, non-profit and academic sectors as well as from the United Nations. Grupo Vicini, the Intergovernmental Renewable Energy Organization (IREO) and the Center for Export and Investment of the Dominican Republic (CEI-RD) were sponsors. The program included a facilitated debate, case study presentations and a field trip to an ethanol distillery. 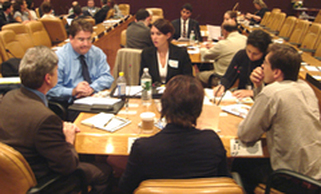 Earlier events in the series were held at the United Nations in New York in May and June 2009. Some 65 mostly Dominican participants engaged in discussions aimed to achieve investment and commercial opportunities resulting from consultations among interested parties. A group of 25 high-level participants from the Dominican Republic, the US, Haiti and the United Nations met in continuation of PPAF’s May 7 Third Annual Partners Against Poverty event at the UN. The May event was a facilitated discussion for Business Model Innovation on the development and production of ethanol and biofuels. Participants in the June meeting used the same approach to examine more deeply financial sector challenges and opportunities for bioenergy. Members of the private banking community, private investors, the Inter-American Development Bank, the United Nations Environment Programme, the UN Foundation and related organizations participated. Also present were directors of biofuel companies, energy consultants and strategists, and finance attorneys. The Foundation's Third Annual Partnerships Against Poverty featured discussions on investment partnerships for ethanol development and production. A group of 45 selected professionals from Brazil, the Dominican Republic, Haiti, Honduras, and the U.S. met at the United Nations for a facilitated discussion on ethanol and related bioenergy organized by the Public-Private Alliance Foundation and ResearchPAYS®, Inc. The participants represented the stakeholder interests of government, private sector, civil society and international organizations. Among the participants were representatives of state-of-the-art pioneer companies, business associations, banking and investment firms, university and foundation researchers, and a bioenergy specialist from the Inter-American Development Bank. The UN Office for Economic and Social Council (ECOSOC) Support and Coordination convened a meeting with UN Public-Private Alliance for Rural Development (UNPPA) countries. Participants included representatives from the UN delegations of Angola, the Dominican Republic, Ethiopia and Madagascar and from the UN Division for Sustainable Development, the UN Office for Partnerships, and from the Food and Agriculture Organization of the UN (FAO), the International Fund for Agricultural Development, the World Food Program and the Public-Private Alliance Foundation. PPAF and the others present were assisting the UN Department of Economic and Social Affairs to prepare the Secretary-General’s report to ECOSOC on UNPPA. 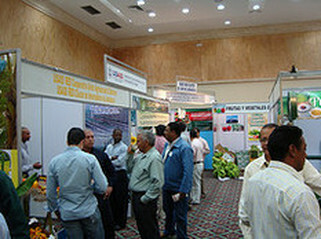 Agroalimentaria 2009 brought together potential buyers, both national and international, and many of the best producers of agricultural products in the Dominican Republic. PPAF participated at the invitation of the Dominican Government. Organized by the Center for Export and Investment of the Dominican Republic (CEI-RD), and the Junta Agroempresial Dominicana, Inc. (JAD), it was held at the Dominican Fiesta Hotel and Convention Center in Santo Domingo. Produce stands featured fruits, vegetables, coffee, cocao, beverages and cigars. The Fair showcased local products, provided an environment for business people to meet and negotiate deals, and hosted workshops on technical topics of tropical production, processes, and markets. Seventy representatives from the United Nations, the private sector and civil society met for a half-day of deliberations on “Partners against Poverty – Awareness, Agreements and Actions”. Chaired by David Stillman, Executive Director of PPAF and facilitated by the UN Public-Private Alliance for Rural Development (UNPPA), this second annual meeting touched on a wide range of topics related to the Foundation’s areas of work, including: agribusiness; tourism and the environment; women, entrepreneurship, and microfinance; health; and renewable energy. Introductory remarks were followed by general comments, small-group discussions and reports to plenary on the above topics. The meeting concluded with plans for next steps among new and continued partnerships. PPAF's Executive Director David Stillman and board member Scott Wright joined Ambassador Zina Andrianarivelo in Madagascar to attend the Roundtable of Partners to the Madagascar Action Plan (MAP). The MAP was intended to cover the period 2007-2012. PPAF met with the Prime Minister, the Minister of Economy, Trade and Industry, and representatives of UN agencies and companies. The group spoke extensively with the adviser to the President on agribusiness and rural development. 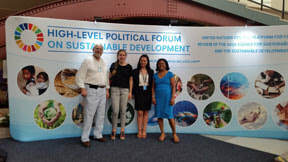 David Stillman, with colleagues Frank and Dana Minaya from Samana College Research Center and Mercedes Garcia of TerrAqua, participated in this meeting on sustainable tourism. 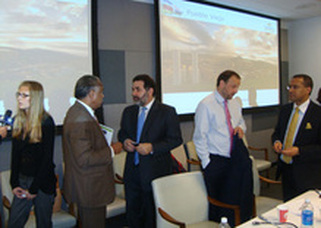 Held in Santiago de los Caballeros, it was attended by 144 tourism industry representatives from the Ministry of Tourism, Ministry of Environment and Natural Resources, Central Government, municipalities, universities, NGOs, International Agencies, Global Sustainable Tourism Alliance and partners (The Nature Conservancy and Rainforest Alliance, among others) and the 9 Tourist Clusters in the country. 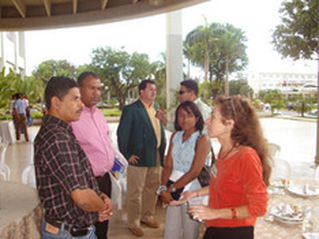 December 3-5, 2007: 1st International Congress on Aquaculture in the D.R. The First International Congress on Investment, Education and Transfer of Technology for Development of Aquaculture in the Dominican Republic took place in Santo Domingo at the Autonomous University of Santo Domingo (UASD). A team from UASD, the Dominican Aquaculture Association (ADOA), farmers, private investors, the Fisheries Council of the Dominican Government (CODOPESCA), the Dominican Institute for Agribusiness and Forestry Research (IDIAF) and others led the preparations in collaboration with PPAF. Over 70 attended, including business people, academicians, Dominican government officials, local farmers, representatives of non-governmental organizations, commercial interests, United Nations organizations, the European Union, Taiwan, US Department of Agriculture and others. 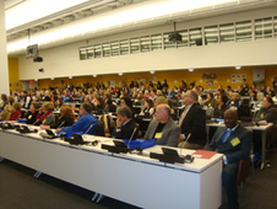 Over 1,700 people from 62 countries attended the 60th Annual DPI/NGO Conference at UN Headquarters in New York from 5 to 7 September 2007. Representatives of Non-Governmental Organizations (NGOs) attended roundtables, panels and workshops during the 3-day event. The Conference reviewed the scientific evidence on climate change, including its consequences on indigenous peoples, water security, land use and the politics of energy. Ambassador Lorenzo and Dr. Stillman spoke at conference events about partnerships, rural development and the significance of climate change to island countries. PPAF co-organized a luncheon for about 60 principal conference speakers and other participants. July 26-29 2007: New Regional University Center- San Pedro de Macoris, D.R. in San Pedro de Macoris. In a rare event, the Rector and Council of the Autonomous University of Santo Domingo met away from the main campus and participated in the ribbon cutting. UASD is the first university in the Western Hemisphere, established in 1538. The opening of the San Pedro de Macoris branch means that many local students will be able to afford and obtain higher education. 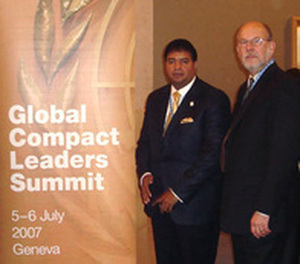 The second UN Global Compact Leaders Summit took place at UN Headquarters in Geneva, Switzerland. 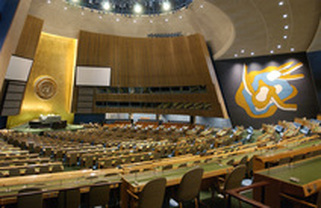 The Summit, co-chaired by the UN Secretary-General Ban Ki-moon, gathered over 1000 chief executive officers, government ministers, heads of civil society and labor organizations from all over the world - making the Summit the largest event ever convened by the UN on the topic of corporate citizenship. Daniel Mejia, Board Chair, Amb. 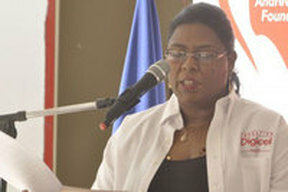 Zina Andrianarivelo (Madagascar), Amb. Francis Lorenzo (D.R. 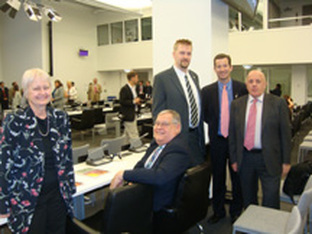 ), and David Stillman, Executive Director, represented PPAF. Mr. Daniel Mejia, a businessman, announced his initial support to the Foundation with a major gift. PPAF has its roots in the UN Public-Private Alliance for Rural Development, which was an initiative of the UN Economic and Social Council (ECOSOC). Pictured above: Amb. L. Merores (Haiti) (VP of ECOSOC); Amb. 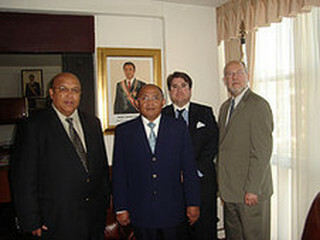 Z. Andrianarivelo-Razafy (Madagascar); D. Mejia; D. Stillman; Amb. F. Lorenzo (Dominican Republic). 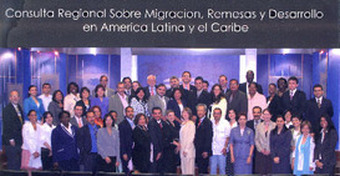 July 27-28 2006: Regional Consultation on Migration, Remittances, and Development. Just before the Foundation was officially registered as a non-profit corporation, Foundation founders including David Stillman and Amb. 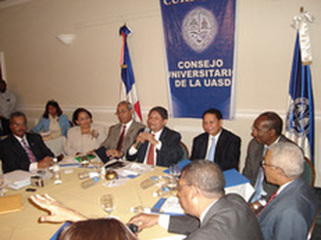 Francis Lorenzo worked with the UN Development Program, the Government of the D.R. and many others to convene the Regional Consultation on Migration, Remittances and Development in Latin America and the Caribbean, held in Santo Domingo, D.R. This brought together 75 representatives from 13 countries, namely Brazil, Bolivia, Colombia, the Dominican Republic, Ecuador, El Salvador, Guatemala, Haiti, Honduras, Jamaica, Mexico, Nicaragua and Peru. Results are available as a document presented to the UN General Assembly by the Dominican Government: GA Document A/61/343 .